PacketExpert™ is a portable (USB based) Quad Port Ethernet / VLAN / MPLS / IP / UDP Tester with 4 Electrical Ethernet Ports (10/100/1000 Mbps) and 2 Optical Ports (1000 Mbps). Each GigE port provides independent Ethernet/VLAN/MPLS/IP/UDP testing at wire speed for applications such as BERT, RFC 2544, and Loopback. BERT is implemented for all layers (as depicted below). RFC 2544 is applicable for Layers 2, 2.5, and 3, and Loopback is applicable for Layers 2, 3, and 4. It truly takes confusion out of Ethernet / IP testing at all protocol layers - from Layer1 frames to IP/UDP packets. It can be used as a general purpose Ethernet to IP performance analysis tool for 10 Mbps, 100 Mbps and 1 Gbps Ethernet local area networks and wide area networks (WAN). Two of the 4 ports in the PacketExpert™ unit support both electrical and optical interfaces per unit, enabling testing on optical fiber links as well. The electrical ports support 10/100/1000 Mbps, and optical ports support 1000 Mbps using SFP. 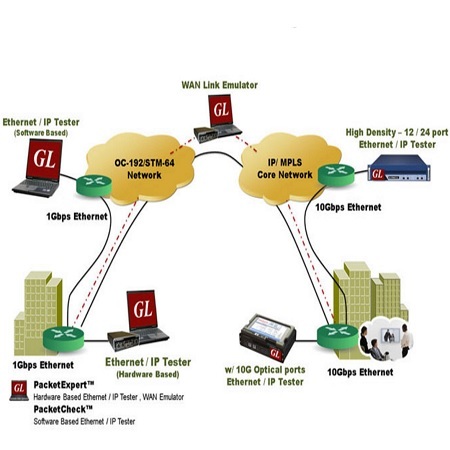 With IPLinkSim™ feature, the PacketExpert™ also emulates a bidirectional IP WAN link on these two ports.